Ever since I picked up my 85 coupe every so often it would blow out a big cloud of smoke upon start-up then it would be fine after that. It didn't always do this but I found that more often than not it would smoke right after I had just run the car and restarted. Conventional wisdom says the issue is a leaking valve stem oil seal. The first time I changed out the spark plugs both the intake and exhaust plugs for cylinder #1 were fouled with gunk whereas the other six plugs were relatively ok. Putting 2 and 2 together I determined there was likely a leaking seal in cylinder #1. Replacing valve stem seals is not something I'd ever done before so I went to youtube and found several videos on how it's done. "It seems pretty straight-forward" says I. 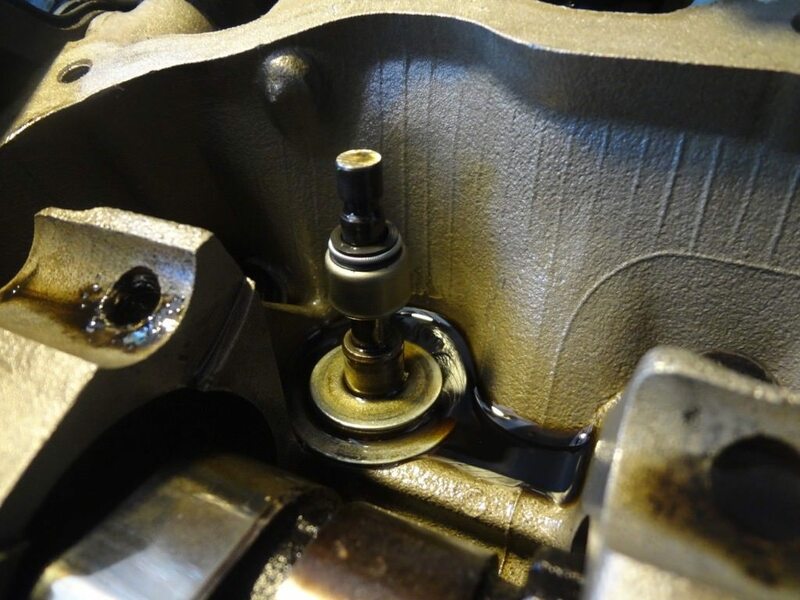 One cool thing I learned is you can force air into the combustion chamber through the spark plug hole using a compressor and that will force the valve to stay in place. You sure don't want one to fall down into the combustion chamber or you'll be looking at removing the head just to retrieve it. So I did some quick math and determined to buy a compressor, a valve spring compression tool, an engine compression tester, and other odd bits like a compressor hose and attachments. I figured if I hired the job done it would cost me about the same as buying all that stuff, only now I get to own all that useful stuff. First things first, I decided to replace the belts while I was tearing into things because they were old, cracked, and one had a six inch frayed spot. I removed the air intake stuff from the MAF sensor to the throttle body. Then I dropped the under carriage splash guard and removed the fan shroud and the fan blades. This made for easy access to the belts. I knew this car had a new alternator, radiator, and brake master cylinder but I also discovered it has a new water pump. Hooray! After all that, the first thing to do is remove the valve cover and take off both rocker assemblies. Remove 5 bolts each and these can be lifted off and set aside. Next, I pulled out all 4 exhaust side spark plugs because they are simply easer to get at than the intake side. Here's where the compression gauge tool comes in handy. The gauge comes with a short hose attachment with a threaded end that matches the spark plug mounting hole. 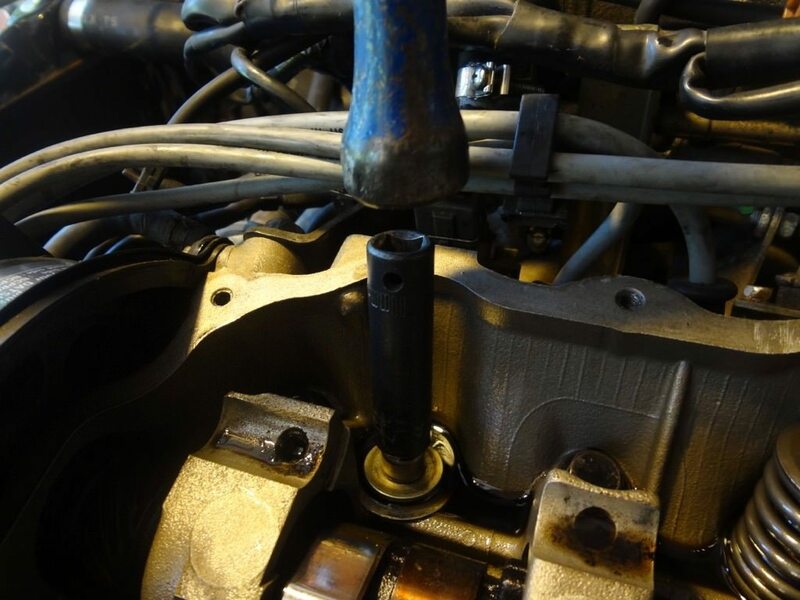 Simply thread this hose into the engine block and connect it to compressed air. Remember to remove the Schrader valve from this hose first. I found that 50psi was more than enough pressure to keep the valves in place. I started with cylinder #1 but my photos jump around a bit for the purpose of illustration. Using the valve spring compression tool, grab as much of the spring as you can get ahold of and compress the spring as far as it will go. Sometimes even after compressing it remains seized to the top of the valve stem. Simply tap on the top of the compression tool to dislodge it. 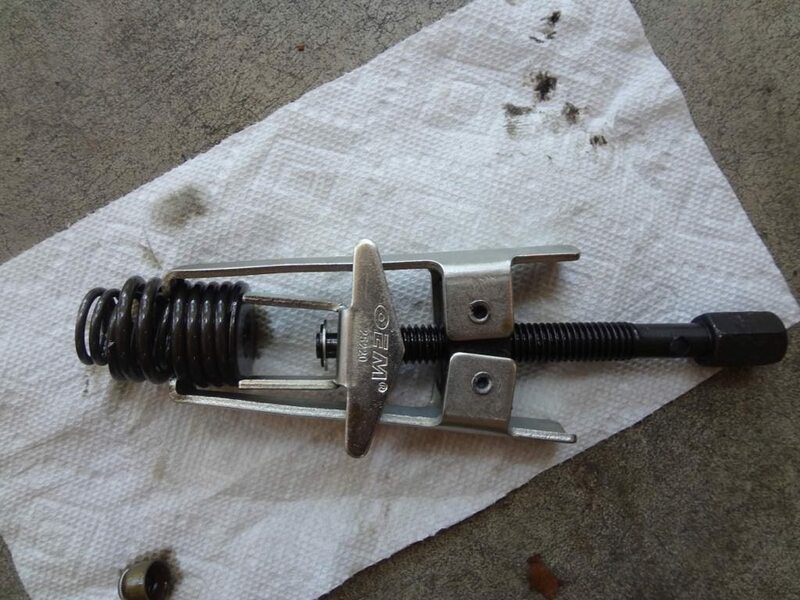 Now the spring is easily moved around and exposes the valve spring keepers. Press down further on the tool and remove the two little keepers with a magnet. Once the two keepers are removed leave them attached to your magnet because they are very small and if you lose one you cannot run your engine. 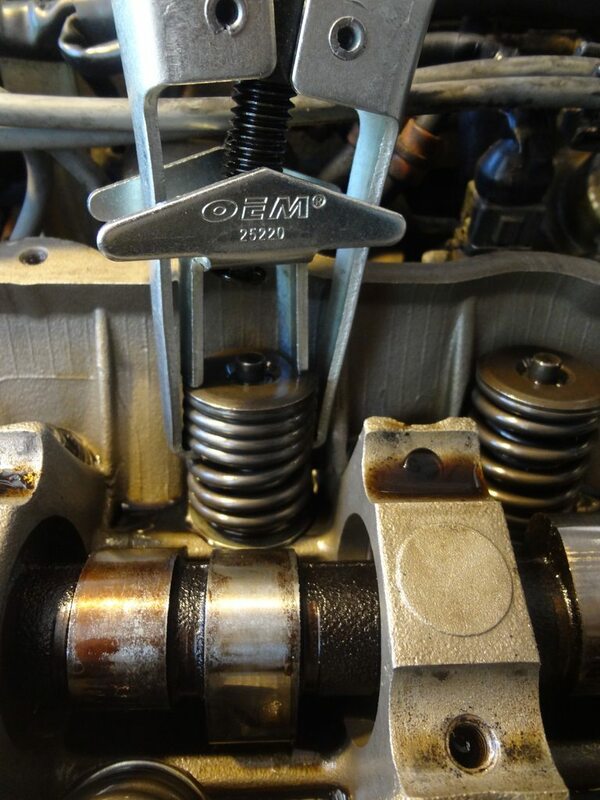 Remove the valve spring tool and set it aside leaving the spring fully compressed. Remove the old seal with pliers. After I took this pick I found adjustable jaw pliers are easier. Below you can easily see the detent in the valve stem that the keepers will lock into. Dab a little oil on your new seal and slide it over the valve stem. The new seal will need to be seated all the way on the bottom of the stem. I used an 11mm deep socket to gently tap the seal all the way down. Sometimes even though the seal looked to be fully in place I found I could still get my fingernail underneath it so I'd tap it down again. When it's fully in place the tapping sound changes. You'll know it when you hear it. Now you're ready to put the spring back and insert the keepers. Here I'm using needle nose pliers but sometimes I found it easier to use my fingers. When inserting the keepers, push down on the spring to expose the detent in the valve stem that the keepers lock into. Keep your magnet handy because the keepers don't like to cooperate when being installed. They're small, oily, have to be placed precisely into position, and have a knack for flipping around and falling into the wrong spaces. I found after I had done the first few the process got faster. Try putting the first keeper on the left or right side of the valve stem. If you put it in front it's a real booger to flip it around to the back or to try and install the next one in the back. Side to side makes it easier. 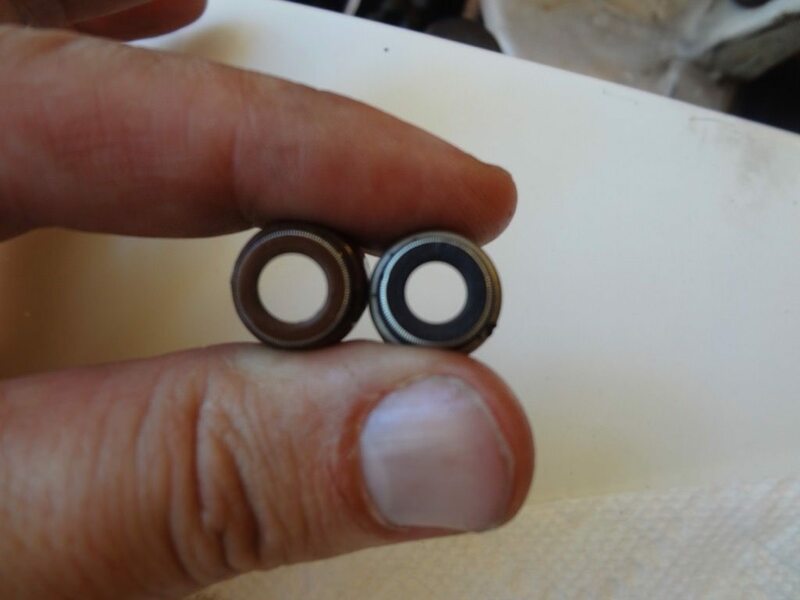 Below I'm comparing a used seal from cylinder #1 to a brand new seal. The difference is subtle in this case but you can clearly see the old one is a bit worn and has a larger hole. This would allow oil to run down the valve stem and drip into the combustion chamber. I figure that depending on where in the stroke the engine happened to stop made the difference as to when oil actually got in there. That explains why the engine only smoked occasionally. If the valve was open when the engine stopped there was a clear path for oil seep in and get burned.. It's not a bad job, really, and the parts are cheap. 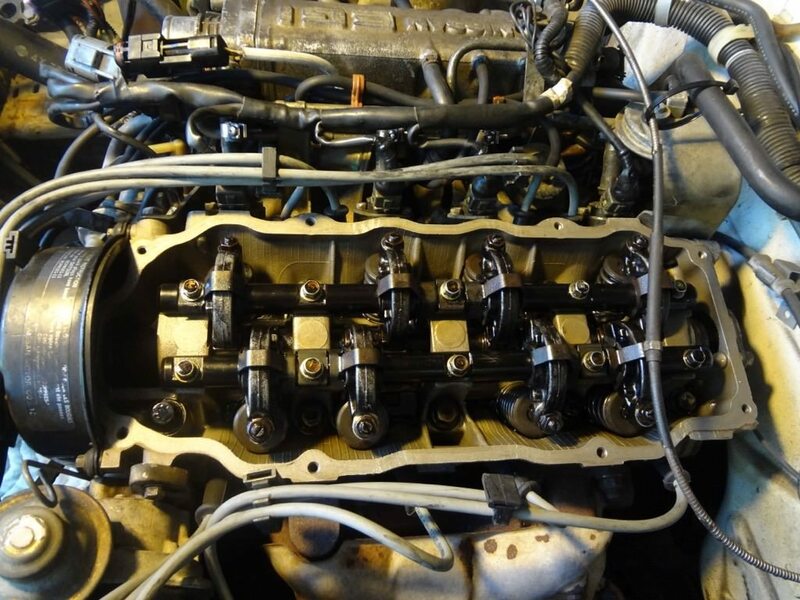 You'll need a full set of 8 stem seals, a valve cover gasket, and I elected to replace the seals around the screws holding the valve cover as well. 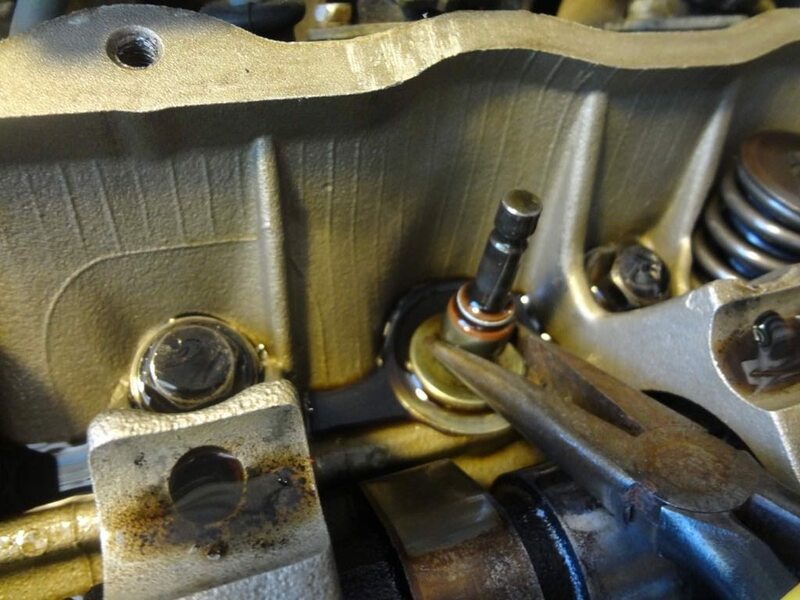 A torque wrench is also a very good idea for torquing the valve train bolts back into position. If you have periodic smoking in your CA20e, this could well solve the issue. Hey, how long do I have to be a n00b? Huh? Definitely one of the nicest instruction/photo write ups I have seen on this club. I will be doing this soon now that I expert non-noob help! Thanks to a fellow CA20 enthusiast! There might be a reason I'm not a mechanic. I didn't mention in this tutorial that when I first removed the rocker arm assemblies several of the bolts holding them to the head were already fairly loose. They were more than finger tight but they sure weren't torqued to spec either. When I saw that I figured it was a very good thing I discovered it before there was a problem. 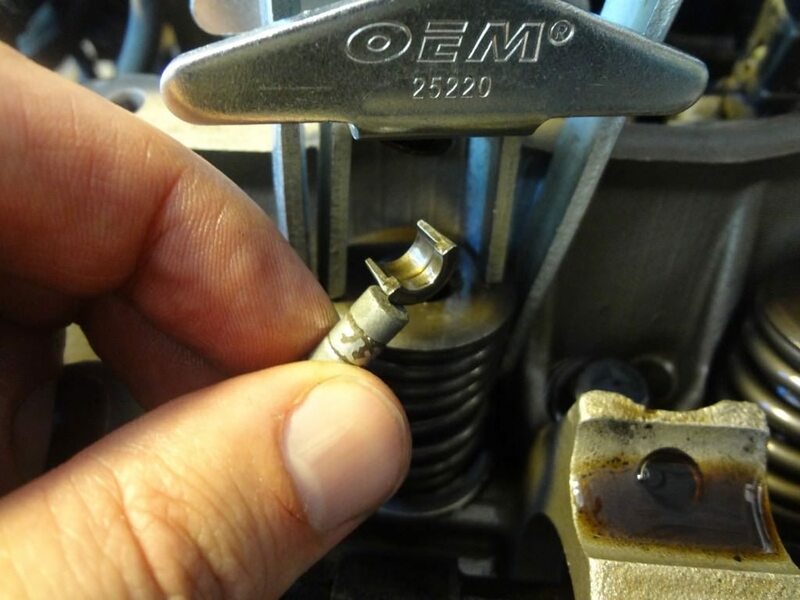 When I reinstalled the rocker arm assemblies I was very careful to slowly tighten the bolts a little bit at a time until I reached the lower level of the torque spec (18-22 Nm) in a cross-tightening formation. What I should have done is to examine the bolt holes more closely and I would have seen the loose ones were becoming stripped out. Below is an example of one of them on the exhaust side. You can see the threads aren't there and there's a little damage around the outside of the hole. A couple days ago there was a gawd-awful racket coming from the engine bay. 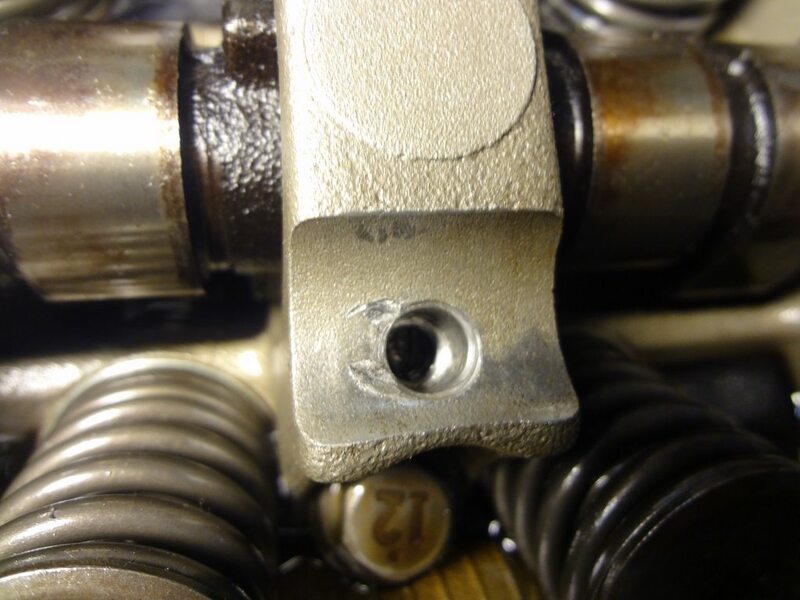 It seems the cam lobes had placed enough upward pressure on the rocker arms to pop the bolts out from the weakened holes securing the rockers for the #1 and #2 cylinder exhaust valves. That meant the rocker shaft was forced to pivot against the center bolt whereupon it had enough of that and snapped in half. You can also see the aluminum threads I removed from a couple of the offending bolts. So I pulled out the remainder of the exhaust side and the intake rocker assembly as well and have determined there are 4 of 10 bolt locations where I'll drill out the holes and install helicoils. The lesson here is take a close look at the aluminum threads inside those holes and be careful tightening the steel bolt into them. If you find any bolts to be under less than torque specification you'd be wise to examine them very closely for stripping. Ouch!! Do you need any parts? I have a spare head gathering dust in my garage. Thanks but all I needed was a new exhaust side rocker arm shaft and it's already ordered. The rest of the job is simply drilling and tapping for the helicoil inserts. The whole job should take no more than 30 minutes I reckon. Just as I figured, the installation of the new rocker shaft went very quickly. The longest part was waiting on the darn shaft to come in. The first place I ordered it from had no status update after 4 days. Here I'd been watching my mailbox expecting it to arrive and when it didn't I checked online to see it was back-ordered. Dammit! Don't sell a part online if you don't actually have the thing! Or at the very least tell me it's been back ordered. Don't just let a customer sit there waiting with no update. So I canceled that one immediately and ordered one from AutoZone and had it in 48 hours. QuirkParts....never again. The four stripped out holes in the header were drilled, tapped, and had coils inserted. Honestly, I felt a lot more confident torquing the bolts into these holes than I did for the other six original thread holes but I set them all right at 20 Nm, right in the middle of the torque spec. Now she's purring again. Pictures restored. Go to hell, Photobucket! Actually the same damn exhaust side rocker shaft snapped again. Of course it's a year out of warranty. 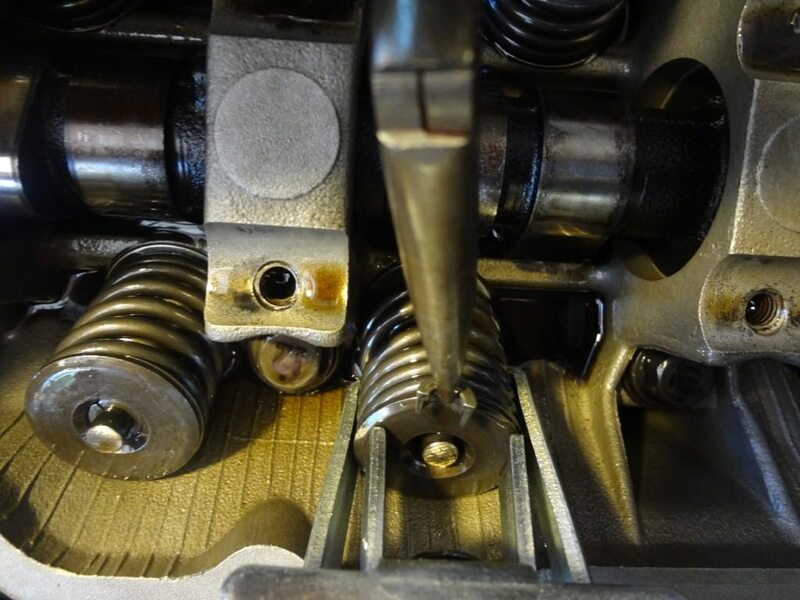 The first time this happened was because of two stripped out holes on the front end of the shaft which left the third bolt, that's the one in the center of the shaft, attempting to secure half of the shaft length. The result? The shaft snaps right in the center. This time the farthest bolt in the rear of the shaft stripped out which put enormous stress on the next bolt forward. It held on like a trooper because it was one of the holes I used a helicoil on two years ago, but even that had it's limits at 75 mph while I was an hour+ away from home. Snap! Then came a sound like gravel in a garbage disposer as the cam lobes drove the broken and now unsecured half-shaft into the valve cover. 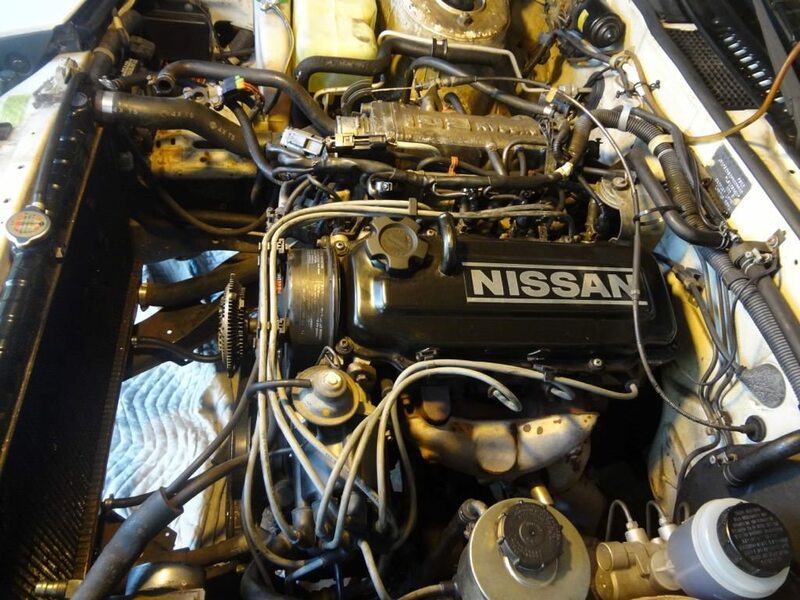 Nissan could have done better with deeper holes and longer bolts to provide a more secure assembly. So here's the lesson: Just drill, tap, and helicoil all 10 rocker shaft bolt holes in the aluminum head. That had better do the job permanently. A new shaft is on the way tomorrow. Oh, and be sure you have AAA. Mine paid for itself today. +1 for AAA and s12 being a match made in... somewhere. Thanks guys. 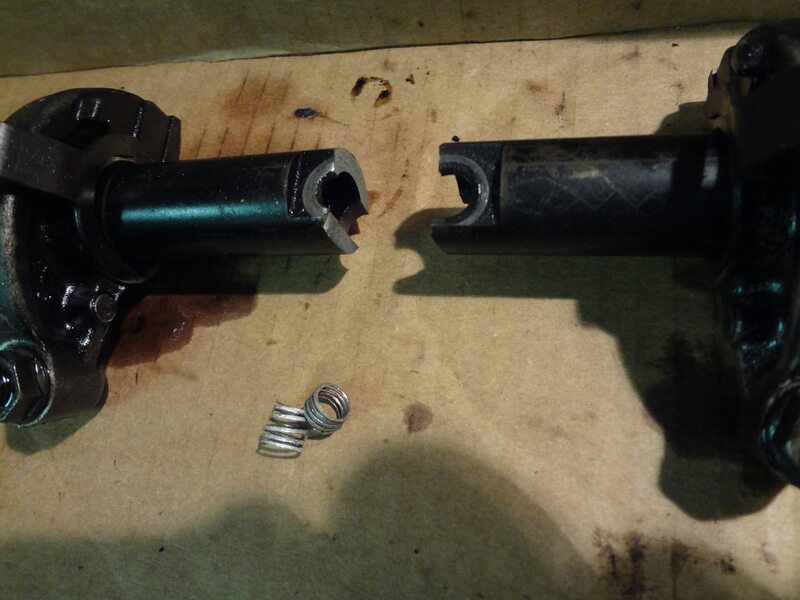 My new (used) exhaust side rocker arm shaft is expected to be delivered tomorrow. Today I’m going to drill out all the aluminum threads, retap the bores, and insert helicoils. All 10 bores will get these steel threads so I can put the maximum specified torque on all the bolts. I don’t intend to deal with this issue ever again. Drilling went well yesterday but for the actual bolt hole that caused the problem. I've been unable to precisely align new threads with the other 4 bolts along the rocker shaft. As a result, the shaft won't fit exactly as it should into the recessions in the head. I see no alternative but to pull the head for machining.